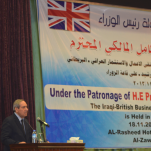 EAME has recently participated in the Iraq Britain Business Council (IBBC) and UK Trade & Investment (UKTI) Trade Mission to Baghdad and Erbil that took place in November 2013. The IBBC facilitates business, trade, investment, human resources, training and transfer of technology and know-how into the Republic of Iraq, seeking to bring together Iraqi, British and international companies and public sector bodies through a joint platform identifying mutual interests and common goals. EAME’s MD was accompanied Zainab Al Ribhawi (EAME Iraq In-Country Manager). Some photos (provided by the IBBC) are shown below. Further details can be obtained from the IBBC website including an IBBC Video of the event. If you have any questions or wish to enquire about our services please don’t hesitate to get in touch.